An emphasis on gaining reimbursement from cancer care places the spotlight squarely on the shoulders of CTRs. When it comes to getting more bang for the buck, the primary focus of many healthcare organizations has been on cardiac disease due to its prevalence in the population and its favorable reimbursement rates from insurers. However, there is growing acknowledgement that cancer will be the disease of the 21st century. While many Americans continue to struggle with diet and exercise, smoking levels have dropped and education regarding coronary artery disease prevention and management has become widespread. Meanwhile, technology has advanced to the point that cardiac interventions no longer necessitate opening the chest for every procedure. As a result, the focus has shifted to the treatment of cancer: a more implacable foe that has many faces. According to the American Society of Clinical Oncology, there will be a 48% increase in cancer incidence and an 81% increase in people living with or surviving cancer by 2020. These numbers underscore the need to collect better and more extensive cancer data to support accurate and cost-effective treatment modalities. Much of this burden will fall on the shoulders of cancer registrars. Toni Hare, RHIT, CTR, wrote in Oncology Issues magazine that the estimated 7,300 cancer registrars currently in the workforce will scarcely satisfy the demand, adding that at least 800 new registrars will be needed. Furthermore, she points out that “only 5 percent of CTR [certified tumor registrar] test takers are younger than age 29.” The crisis deepens when the aging of the healthcare workforce, including both clinical and HIM personnel, is taken into account. Changing educational requirements will also make the shortage more acute. 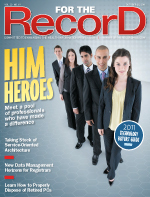 Aware of the need for more highly skilled staff capable of abstracting data from EHRs, the American College of Surgeons’ Commission on Cancer issued a mandate, effective January 1, 2012, that includes strict provisions to “grandfather” existing noncredentialed staff through a three-year, one-time grace period that allows time to prepare for the new exam. Better-educated staff will increase the odds that quality data will be collected, an important factor considering cancer treatments are based on that very same data. Still, there are other obstacles that must be overcome to provide highly skilled registrars with the tools to produce better information. Currently, registrars seek retrospective data from multiple databases with no assurance that data integrity considerations were in place when such databases were constructed. The rush to put EHRs in place has sometimes been followed by a concern about the quality of the data charted by physicians and nurses. Adding to this problem is the current link between ICD-9 (and soon ICD-10) and reimbursement. HIM frequently reports to the finance department, placing the coding stress on the speed to “drop bills” and lower accounts receivable levels. In addition, some organizations have placed coders on tight productivity schedules, leaving little time to consider what codes are actually being collected: the best codes for data integrity or simply the codes that will get a coder within productivity guidelines. When clinicians and coders are driven by short-term productivity goals, long-term goals for good data tend to get lost in the rush. Those organizations in serious pursuit of strong cancer programs dependent on rich, reliable clinical data repositories must reconsider productivity schedules that do not allow for the best data abstraction. Registrars rely on numerous repositories, including master patient indices, EHRs, pathology and cytology databases, and radiology electronic systems. Because cancer abstracts are secondary medical records (ie, information collected from primary systems, where it was recorded during treatment), registrars remain downstream from data entry. With better education, each registrar will be more conversant with how to perform appropriate case finding amid the numerous, noninteroperable databases that characterize many healthcare organizations. They will also be better able to assess data reliability and its impact on the information they collect for their cancer programs. Carol Hahn, RHIT, CTR, a cancer registrar II at Presbyterian Healthcare Services in New Mexico, is aware of the challenges of gaining adequate and continuous training. The National American Association of Central Cancer Registries and the National Cancer Registrars Association Surveillance, Epidemiology, and End Results group provide training, but it tends to be focused on small areas or is inaccessible due to registrars’ demanding work schedules, she says. In addition, there has been a leap in cancer findings, resulting in a growth in data collection. Just as the specter of ICD-10 has prompted many seasoned coders to return to college to brush up on anatomy and physiology, medical terminology, and disease complexity, so, too, are registrars required to ramp up their skills. There is no suite of diseases more complex than cancer, and the diagnostic tools available from new research allow for its parsing into more specific disease types. However, these tools generate levels of data that must be collected from a more skilled workforce capable of interacting with numerous EHR systems to locate information down to the molecular level. For example, Hahn says cancer registrars must understand “molecular and cellular tests and the implications for treatment that these tests provide.” She has learned oncology types and their associated tissue tests that can help determine how metastatic colon cancer tumors express the KRAS gene. As researchers provide oncologists more tools to determine cancer specificity at previously unheard of granularity levels, registrars must have the training to keep up with the comparable medical literature and what these new tools mean in terms of demands for greater data abstraction. For instance, Hahn points out that new standards require the sampling of at least 12 nodes surrounding a colon tumor to accurately ascertain the spread of the disease. Registrars have typically been involved in the retrospective collection of information for established cancer patients. However, new trends mean that increased numbers of registrars may be required to gather genomic information to create a full picture of a patient. In the January issue of Scientific American, scientists discussed the cancer-causing mutations that initiate pancreatic tumors and the “exciting prospect” that there may be plenty of time for doctors to intervene before pancreatic cancer becomes lethal. Registrars will be faced with the prospect of gathering data from screening tools that may demonstrate mutations indicating the possibility that a patient has the beginnings of pancreatic cancer. “In February 2010, researchers at the University of California, Los Angeles, compared the RNA found in the saliva of 60 treatable pancreatic patients with the saliva of 30 cancer-free individuals and identified four RNAs that together could correctly identify the cancer 90 percent of the time,” wrote Melinda Wenner Moyer in the article. With the help of researchers, physicians skilled in documentation, and registrars with advanced data skills, future pancreatic cancer patients may be as fortunate as U.S. Supreme Court Justice Ruth Bader Ginsburg, who had her “small pancreatic cancer” diagnosed when she was undergoing a routine CT scan. David Tuveson, MD, PhD, an oncologist at the Cambridge Research Institute in England, says early detection using optical tests and blood or saliva should “advance measurably in the next decade.” The advancing requirements for registrar skills will be just in time. The arrival of ICD-10 in 2013 and an increasing emphasis on using SNOMED-CT as the nomenclature designated to express EHR content in searchable codes further extends CTR responsibilities. More knowledgeable ICD-10 and SNOMED coders will gather unprecedented amounts of data with enormous range and granularity. Registrars will be able to collect previously elusive patient information through access to EHRs. For example, a cancer patient’s smoking history, including inception, number of years, and frequency, has been difficult to abstract from a hodgepodge of paper and electronic records gathered from multiple sources, including inpatient, outpatient, and home care sources. When fuller patient information becomes available, registrars with an in-depth understanding of electronic systems will be able to create more complete pictures that may provide keys to prevention or early detection rather than relying on retrospective treatments. Registrars will be able to gather patient profiles that contain data regarding their physical environments, diets, occupations, relationships, and weight patterns. This type of data gathering can prove or deny the allegations of studies such as the China-Cornell-Oxford Project. In 2005, T. Colin Campbell, MD, published the book The China Study, which summarizes the project. The study was an attempt to understand the reason for the vast differences in cancer rates among Chinese counties. According to Campbell, the primary answer turned out to be differences in animal food consumption. “One of the most dramatic findings of the China Project was the strong association between foods of animal origin and cancer. ... We found that one of the strongest predictors of Western diseases was blood cholesterol. ... Lower blood cholesterol levels were linked to lower rates of heart disease, cancer and other Western diseases,” he wrote. However, these assertions regarding the consumption of animal products and a corresponding relationship to cancer have been tough to prove due to data inadequacies. It’s possible that EHRs and PHRs will someday be accessible to registrars whose data gathering may predict which patients will contract specific cancers before the disease arrives. Along those same lines, EHRs will someday house genetic information. In fact, the AHIMA recently named genomics as a potential career path for HIM professionals. Genetic information will be another data source that registrars will need to mold into abstracts to help determine a patient’s likelihood of developing cancer. From that information, patients may be able to take preventive action to slow a disease’s progress. Last, but not least, is the relationship between cancer care and healthcare costs. With daily pronouncements in the media that healthcare costs must be controlled, better interoperability between databases could save the industry millions of dollars. Tumor registrars closely monitor their subjects and constantly enter each patient’s data into vast, sophisticated registry databases. Yet, due to a lack of interaction between these systems and EHRs, patients are routinely subjected to unnecessary testing, using precious healthcare resources unnecessarily. It is safe to assume that registrars possessing the new, enhanced skills will spot such trends more frequently, giving rise to the possibility that the healthcare industry will use the findings to create a more efficient, economically viable system. Improved collection of patient information that includes data selected by tumor registrars can give all caregivers and data managers the ability to make better decisions for individuals as well as the general healthcare population.